Elizabeth Gonzalez is the fortunate winner of a $5,000 scholarship promotion offered by Magnum Insurance to residents of the Chicagoland area; during the months of June, July and August of 2014. Hundreds of residents registered to win this scholarship. Magnum Insurance offers auto, home, health, life, and many other types of insurance. Magnum continues to provide excellent service in our community and has done so for more than 33 years with locations all over Chicago and its suburbs. For more information call 888-539-2102 or visit www.magnuminsurance.com. St. Augustine College serves the educational needs of the community with four locations in the Chicagoland area and one in Aurora. For more information call 773-878-8756 or visit www.staugustine.edu. 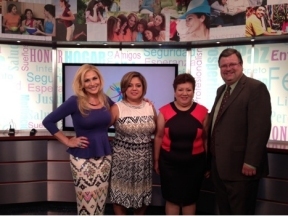 PHOTO: Zoe Torres, Program host “Vida Mujer”; Ericka Ceballos, President, Magnum Insurance; Elizabeth Gonzalez, scholarship winner; Dr. Andrew C. Sund, President, St. Augustine College.